Is It Time to Replace Siding? Even with the best care, some siding will have to be replaced at some point. Here are some signs that it is time to replace the siding on your home. Upgrading to a high quality, long lasting siding makes your home look great, adds value, and requires little to no maintenance. 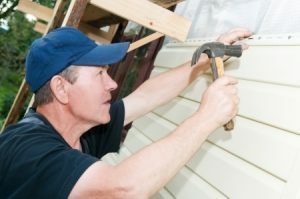 Maintenance – If you find yourself having to constantly maintain and repair your siding it may be time to look into new siding for your home. Vinyl siding is a great option for a low maintenance material. Other materials such as wood siding require more upkeep and maintenance to stay in good shape. Keeping the siding clean is really the only maintenance required for vinyl. Holes or Cracks – If the siding of your home is damaged and repairs don’t hold, replacing the siding is your only option. Damaged places in the siding can allow moisture and debris to seep into the structure of your home. Rot – If your siding has begun to deteriorate there is some hope of being able to fix the affected areas. However, if the rot has already spread then it is time to have it replaced before the damage spreads to the internal structure of your home. Thompson Roofing and Siding installs high quality vinyl siding because of it’s durability and weather resistance. If you are looking to replace the siding on your home, give us a call today for more information. Free estimates are available. Posted in Uncategorized on August 1, 2016 at 7:40 pm by Thompson Roofing & Reconstruction.